Based on the ultra compact Pico-ITX form factor, measuring 10 cm x 7.2 cm, the VIA VAB-800 is the first VIA Pico-ITX board to feature an ARM SoC. With the choice of either an 800MHz or 1GHz Freescale Cortex-A8 ARM SoC, the VIA VAB-800 combines two integrated GPUs for dual displays and 3D/2D graphics acceleration to provide full HD playback support for resolutions up to 1080p. The ultra compact VIA VAB-800 Pico-ITX is optimized for both performance and power to meet the high end demands of advanced industrial and in-vehicle applications, boasting a ruggedized design with a wide operating temperature range from -20 to 70°C, while offering extremely low power consumption of a maximum 5W TDP. In addition to the ruggedized design VIA offers up to 7 years longevity support. 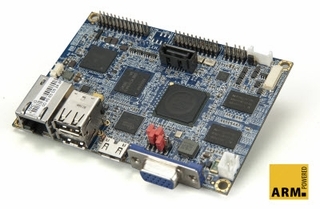 On board pin headers provide support for an additional of two USB 2.0 ports, one SATA connectors, two COM pin headers, two single channel LVDS connectors, one SDIO pin header, and eight GPIO pin headers.